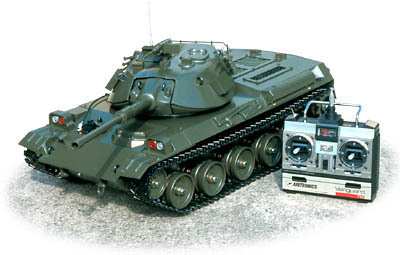 It was originally designed for enthusiasts of gas powered R/C tank,which was semi assembled kit. However for more easy assembly, maintenance, we released electric powered vesion for many people. FULL METAL HEAVY R/C TANK KIT. LOOKS EXACTLY LIKE A REAL TANK. super fine finished bearings are equipped on 20 locations withiin a bear box. operation can be controlled by clutch shifting inside of a gear box. Caterpillar consists of 77 pcs. of metal block and 154pcs. of metal pin. canopy, hatch and other accessories precisely made like a real tank.